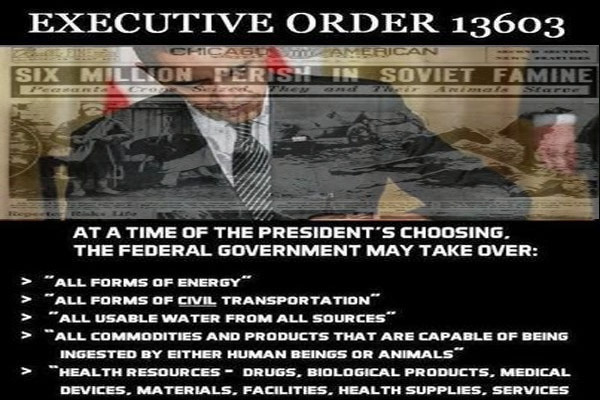 Will Newly Signed Obama Executive Order Pave Way For 'Final False Flag' Leading To Global Dictatorship And A 'New World Order'? While many have been quick to point out that the latest Executive Order signed by Barack Obama to 'ensure a smooth transition' between the new, incoming president in January 2017 and his administration is standard and only traditional and George Bush signed such an Executive Order as well, as we learn in the 1st video, this latest Executive Order may be anything but 'standard' and 'traditional' and differs greatly from the one George Bush signed back in 2008 in one major way as looked at in much more detail below. Considering everything else that we've been witnessing around the world recently, including John Kerry's recent statement to graduates at Northeastern University to 'prepare for a borderless world' as well as Barack Obama's recent warning to graduates of Howard University to 'be ready for profound change in our society and our economy', some believe that Mr. Obama's most recent Executive Order may be preparing for the 'final false flag' in America to bring in the 'New World Order'. You can see the full executive order embedded below videos. When this Executive Order first was released, (yes, on a Friday...why Friday?) we too believed this was quite normal as we were aware of the similar order signed by Bush back in October of 2008, soon before the November election. 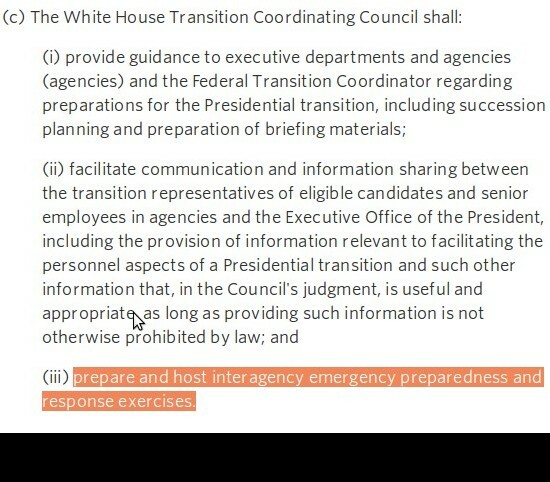 However, once we began researching it, we noticed one major difference compared to the one Bush signed back in 2008; this Executive Order specifically mentions that the 'transition team' will be involved in the preparing and hosting of interagency emergency preparedness and response exercises as seen in the screenshot of the new executive order above. Do they know something that we don't know? Why didn't Bush include similar language and 'exercises'? According to a story from Infowars that came out in late April, the elite and 'new world order' are so petrified of Donald Trump that they may be preparing to declare martial law to stop him. Is that what these 'exercises' refer to? As has been pointed out time and again on ANP and elsewhere in the alternative media, George Soros' slovenly gang of paid rioters have threatened to interrupt the 'political process' as has ISIS and 'black lives matter' and 'orchestrated terrorism' is on the rise in America. 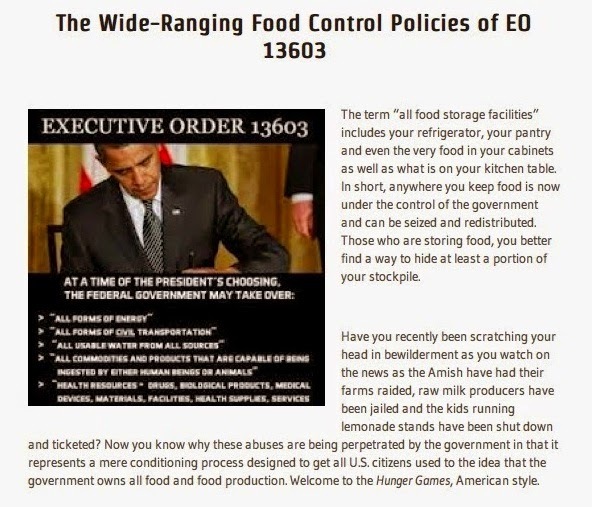 But more than previous national security executive orders, Obama’s 13603 seems to describe a potentially totalitarian regime obsessed with control over everything. Obama’s executive order makes no effort to justify the destruction of liberty, no effort to explain how amassing totalitarian control would enable government to deal effectively with cyber sabotage, suicide bombings, chemical warfare, nuclear missiles or other possible threats. It’s quite likely there would be greater difficulty responding to threats, since totalitarian regimes suffer from economic chaos, colossal waste, massive corruption and bureaucratic infighting that are inevitable consequences of extreme centralization. Such problems plagued fascist Italy, Nazi Germany, the Soviet Union, communist China and other regimes. Totalitarian control would probably trigger resistance movements and underground networks like those that developed in Western Europe during the Nazi occupation. Totalitarian control could provoke more political turmoil than there was in the Vietnam War era of the 1960s. There would probably be a serious brain drain as talented people with critical skills escaped to freedom wherever that might be. Canada? 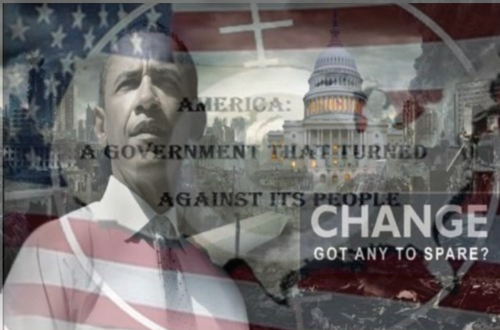 Do we really think that Mr. Obama and the 'New World Order' will simply give this all up when they have been working to destroy America and eliminate our national sovereignty for years? The global elitists have been spending trillions of dollars to implement their global dictatorship, and now even folks such as John Kerry are openly talking about it...a 'borderless world'...when will they tell America of this 'brave, new world', when it's already too late to change? As we learn in the final video below, a video recently linked to by Steve Quayle in his hot news headlines, it may already be way too late. 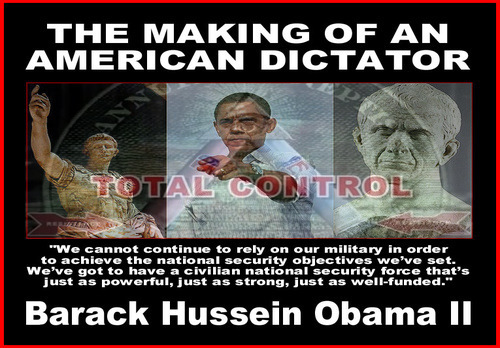 According to that video, Obama may be preparing to declare martial law as soon as August of 2016. 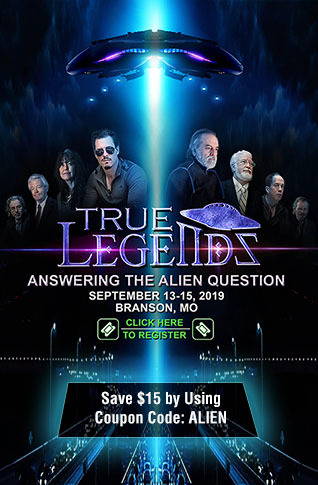 While at ANP we don't like putting exact dates on possible future events, we have to ask, is that what all of the preparation that we've been witnessing across America recently is for? While at this moment, we are unable to confirm that Mr. Obama's most recent Executive Order will be used in part to enable and cement his own dictatorship, we have to remind you that back in December of 1991, the huge majority of the people of the former Soviet Union had no idea that their 'Union' was about to dissolve. For many years, people such as Alex Jones at Infowars, Steve Quayle, the Hagmanns, Oathkeepers and many other 'Watchmen' have been sounding the alarm of the dangers that were coming to America. Many have refused to listen but millions more have been 'awoken' to globalism and the resultant 'incineration' of our civil liberties here in America and the other results that globalism has brought, including loss of jobs and national sovereignty. The political result of that awakening has been the rise of Donald Trump with even Libertarians such as Rand Paul now endorsing him. The signs of the way the coming election might go are also clear; the globalist candidate, Hillary Clinton, will be absolutely slaughtered by the 'nationalist', Donald Trump, as Americans continue to 'awaken en masse' to the carnage this 'new world order' has caused our Republic. All signs now show that the globalists will soon launch one final 'false flag', or series of false flags, to put the final dagger in America's heart. If the globalists have any chance at all of keeping their 'new world order' intact, they'll have to do it soon. It's clear they know that a Trump presidency brings an end to their plans of a neutered America and their dictatorial dreams of global government. The story Steve Quayle linked to this morning from the Army Times tells us that the Army has shrunk to its smallest level since prior to World War 2. Quayle's note on the story told us what the Army Times story didn't. While the Army has shrunk, Barack Obama's 'personal army' has grown in size and strength with weapons, funding and foreign troops seemingly prepared to do the 'dirty work' that the US military won't do. Quayle also reminds us who the 'new enemy' is to 'Obama's private army', the American people. To complete their 'new world order', only a strong America stands in the way. At ANP we're happy to report, with the rise of Trump, a strong America has finally answered the call. Will it be too late?